On Monday evening we pulled away from 116 St. Mark’s Rd in Tecumseh for one last time. After all was loaded in the car and after we had readied ourselves as much as we could we hit the trail. Then came that moment when we had to lock the door and leave. We were so busy in getting ready to go that the magnitude of that moment was lost on us till we were set to close the door. To say that we were emotional about it would be a gross understatement. When we were set to go I took some sidewalk chaulk and I chalked the door. This practice which dates back to the Middle Ages, is customary at Epiphany. It is a simple act of marking the door with 20 C + M + B 12. Christus mansionem benedicat – May Christ bless this house. We were happy to live in a great community for nearly fourteen years. The people in our neighbourhood were great. The Town of Tecumseh is great, and Windsor-Essex is a great community in itself. But what hit us in those moments was the realization that all of the dreaming that we did in that house would now be memory. Our nest for the past thirteen plus years has been 116 and we loved the time we spent there. Now had come the time to move on. One chapter of the book closed and another to open. All of this separated only by a two hour drive. It was a surreal experience really. I could think of no other way to leave the house than asking for a blessing on a place in which we were so blessed. 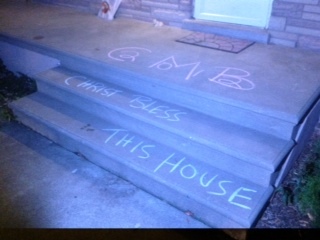 When we arrived at our new home I again Chalked the door and asked God’s blessing on our new home. Here begins new dreams, new hopes and new prayers for a tomorrow wherein we can continue to find ways to better be a people of God living the fullness of being community as God intended. Time will tell what dreams we dream and what hopes will be fulfilled. For now I give thanks for what was and praise God for what is yet to be. This farewell brought a lump to my throat – for the people of St. Mark’s by-the -lake as they grieve the lost of their beloved priest and partner and the generosity of their farewell. And for the people of St. Aidan’s as we know the joy of welcoming Fr. Kevin and Catherineanne to our midst. The use of Christian practices from the early Church I find to have profound meaning for me – I think it is because it shaves back closer to a core of something – I will have to think more about it.